On the eve of the crucial mid-term elections, the Fed’s Open Market Committee meeting and the release of October’s jobs report, the S&P 500 Index (SPX) is slowly approaching a test of a key resistance area located at 1,260. That level represents two forms of “cross” trend line resistance as well the “objective” of a bullish reverse Head & Shoulders pattern that developed earlier this year between April and September. Although the 1,260 level also represents a nearly 6.7% advance from Friday’s closing level of 1,183.26, a sharp post-election spurt higher may provide an opportunity to “lock in” profits before year’s end. In addition, without knowing what next year’s capital gains tax rates will be exactly, it might be a way to offset an unexpected policy risk as well. Nevertheless, a move up to the 1,260 area, if it does occur, would translate into a 13% gain since the beginning of the year. That is more the double the current year-to-date gain of 6.1%. 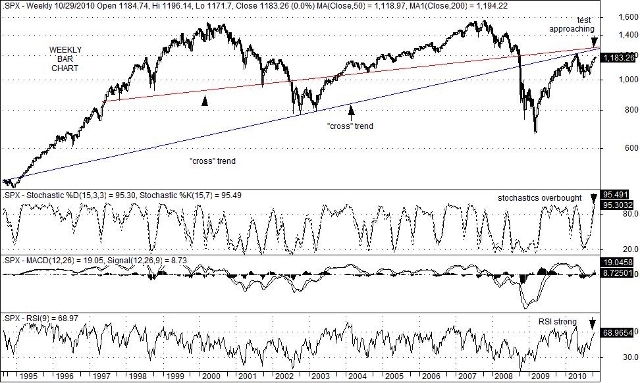 Overbought conditions are now present which suggest upside gains going forward may face a “head wind”. In any event, the upcoming trading week should prove to be one of the most important of the year with some measure of uncertainty removed, Federal Reserve and election-wise. That, in turn, should help investors and decision makers gain more clarity. This entry was posted on Sunday, October 31st, 2010 at 6:02 pm	and is filed under The S&P 500 Index (SPX). You can follow any responses to this entry through the RSS 2.0 feed. You can leave a response, or trackback from your own site.